Ermahgerd you guys. It’s officially Fall, my faaaaavorite season! It still doesn’t feel much like Fall here in Texas, but they’re selling pumpkin spice everything in all the stores, so I’m calling it a win. 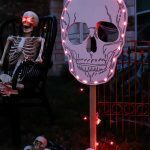 I just love Fall and I’ve added a few decorative touches to our home to celebrate the season. 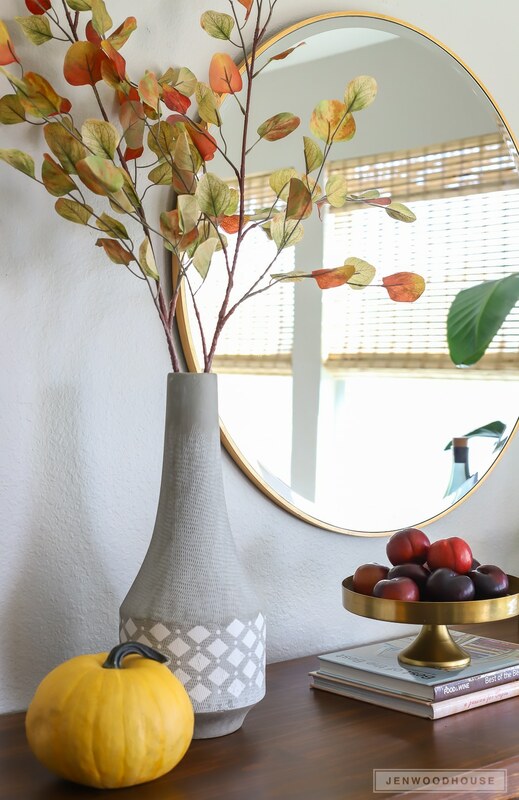 So are y’all ready for a week of inspiring Fall home decor ideas? 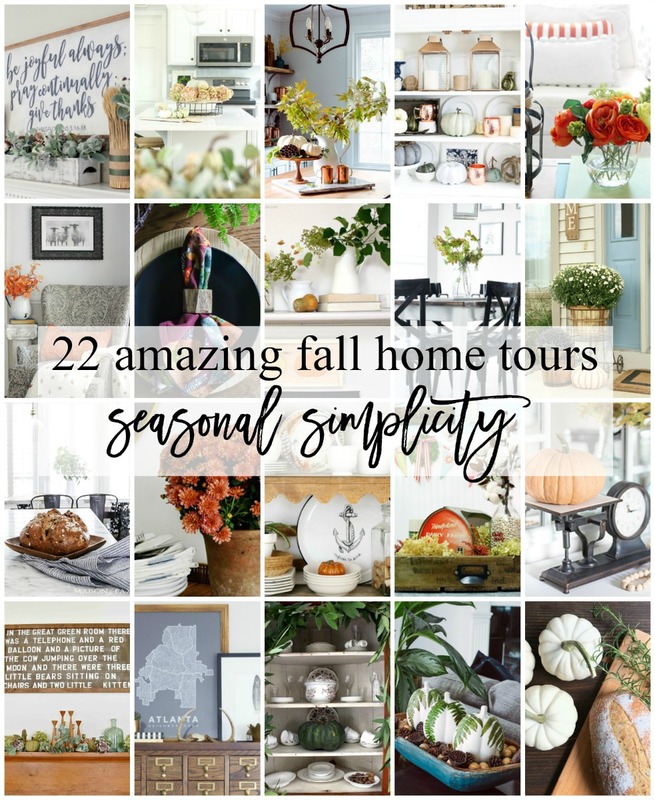 I’m thrilled to be joining several of my talented blogger friends in The Seasonal Simplicity Home Tour, hosted by April from House by Hoff and Krista from The Happy Housie. Be sure you don’t miss the week-long schedule at the end of this post. Welcome to my Fall dining room! 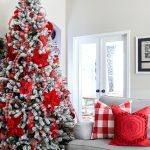 This tour is all about adding simple seasonal touches to your home; no need to stress over this. Lord knows we’ve got enough on our plates (see what I did there?) with the kids in school, the holidays fast approaching, and the year coming to a close. 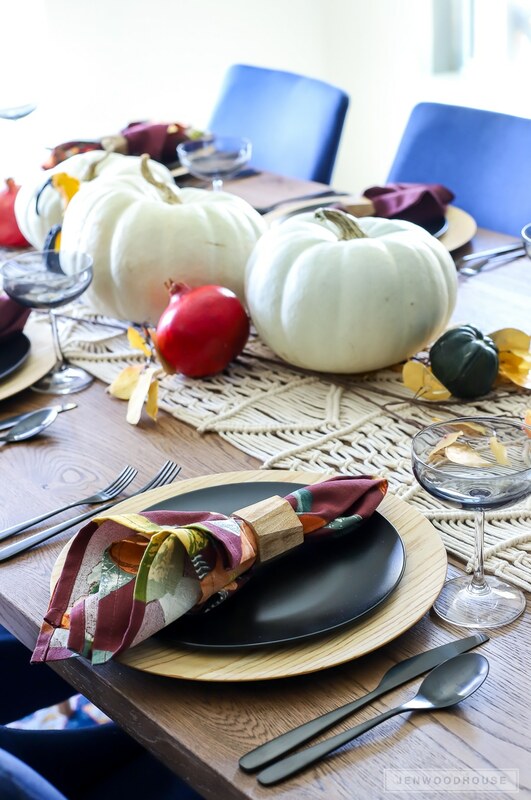 This cozy table setting was really simple to put together. 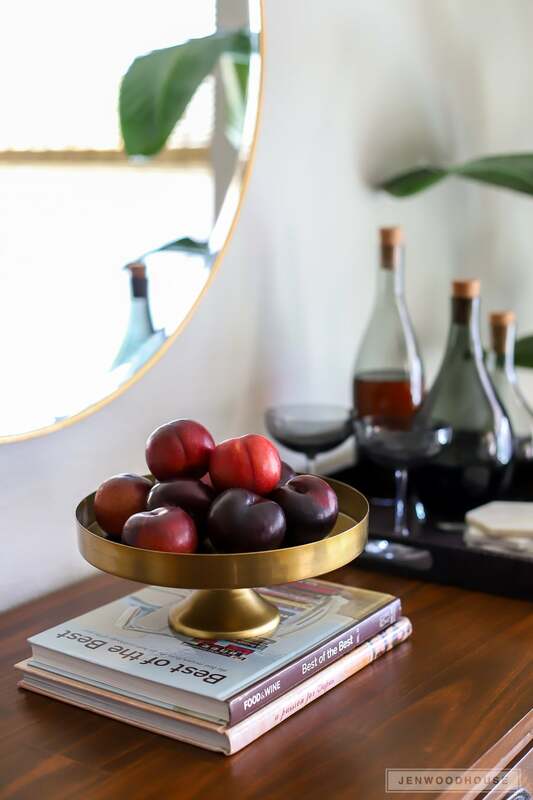 A few pumpkins, pomegranates, and plums serve as the centerpiece. 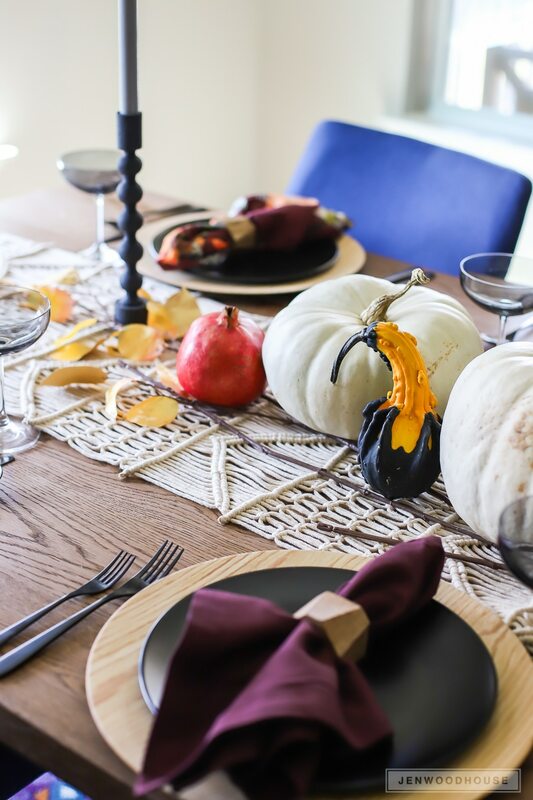 Pair that with some cloth napkins with a beautiful deep burgundy and burnt orange floral pattern on them, and you’ve got yourself a fun and festive Fall tablescape. 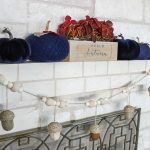 Isn’t this macrame table runner gorgeous? It adds so much texture and coziness to this table. I bought this one from Anthropologie, but my dear friend Aniko makes the most beautiful macrame masterpieces. I’ve gone to the dark side with these matte black plates and flatware. IKEA! Who knew?! And I got the best deal on these wooden chargers at $2 bucks a pop from a local place in Austin called CV Linens. The cloth napkins are from World Market a few years ago. I love the deep Fall colors and the floral pattern is just stunning. If you saw my Summer Home Tour this year, you may recall I was on the hunt for the perfect window treatments for this space. Well, I’m happy to report I finally settled on these bamboo shades and I absolutely love them. 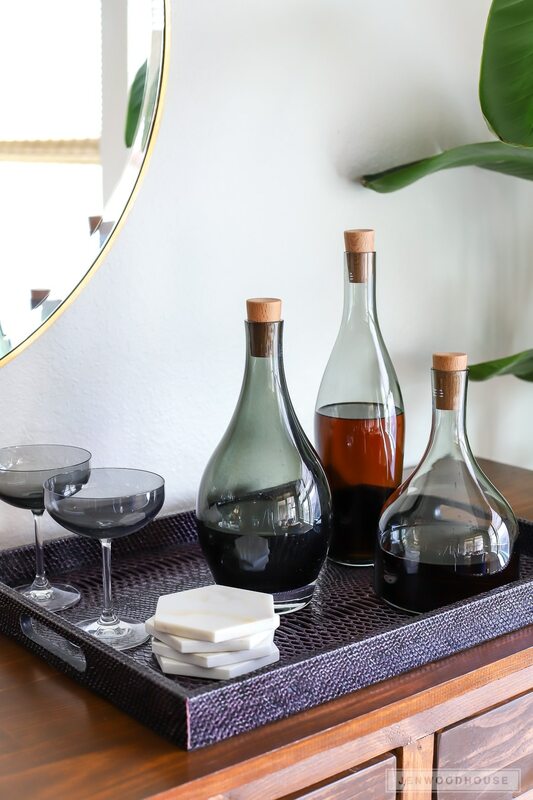 This decanter set is so sleek and cool, right? I’ve been obsessed with smoke glass lately. I recently bought some table lamps for our master bedroom, this decanter set, and wine glasses all in this beautiful smoke glass. I’ve become a fiend for it recently. Someone needs to stage an intervention. I changed out the light fixture yet again. I think I’ve finally settled on these black lantern lights though. I really loved the bamboo pendant I had before, but once I added the bamboo shades, it was just too much of a good thing. 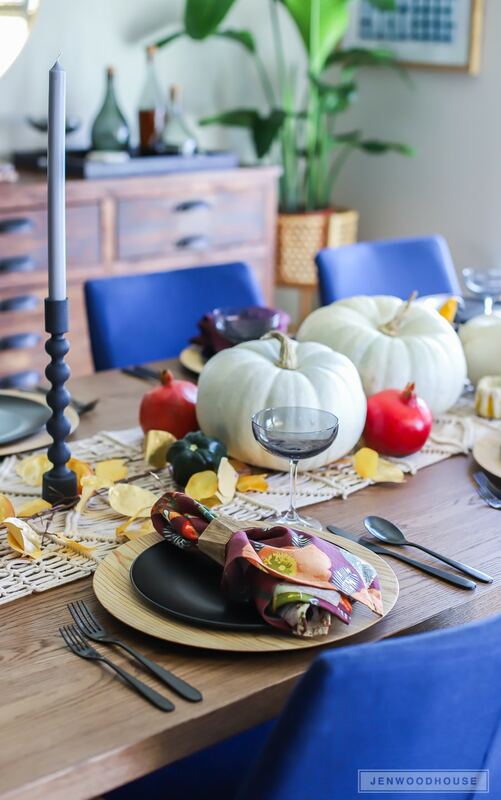 I hope you enjoyed my Fall dining room tour! Be sure to visit the rest of the homes on this tour. Jaime from That’s My Letter is the next stop. 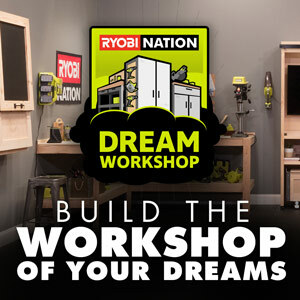 You are sure to leave inspired! Happy Fall, y’all! 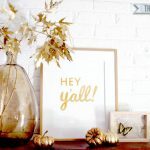 Hi Jen – I’m new to your blog and just realized that you made that gorgeous printmaker’s sideboard! Just wow! It’s such a beautiful piece – and the plans will work perfectly for the sideboard bar we want to build in our media room. 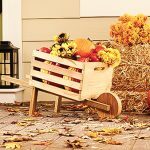 Your house looks gorgeous, and perfect for fall! Cheers! Wow! What a beautiful dining room, Jen. 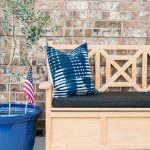 Love that shade of blue on the chairs and the macrame table runner is really cool. Those chairs against all the warm fall bits, it’s stunning! So pretty, casual and sophisticated. This is such a beautiful space, Jen! 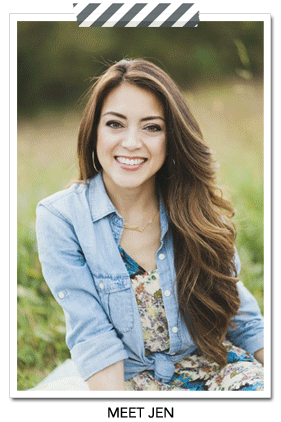 I love the blue accents – so warm and welcoming and beautifully styled!! So glad you could be part of the tour this week! This is gorgeous, Jen! Love the colors and the new lights! See you soon! Where to start Jen! 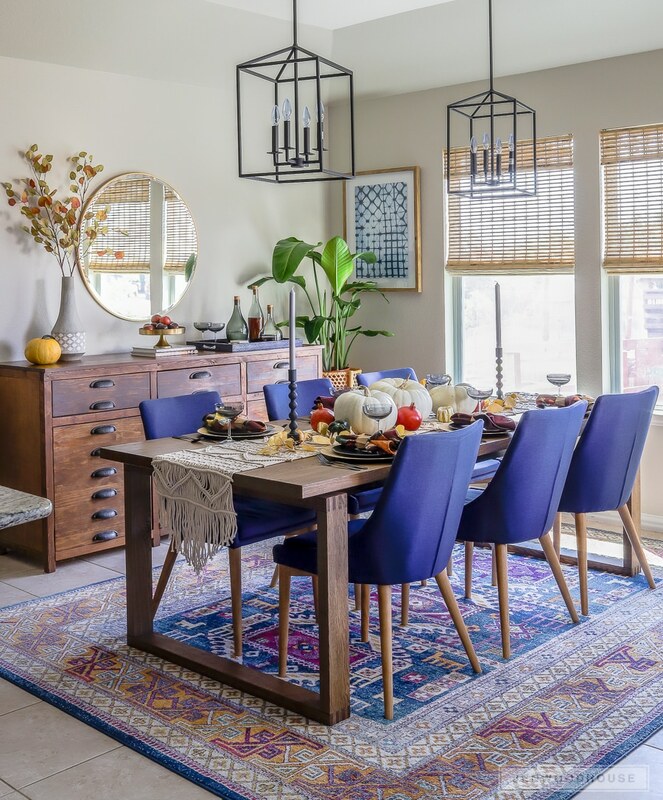 I truly love everything about your dining area from the rug to the chairs and the simple touches of Fall.. love it all! Oh, Jen!! first of all I am a lover of blue so I love all the blue touches in your gorgeous dining room! It is so beautiful and your photography is always so stunning!!! I love your bold color palette in here, Jen! Every detail is gorgeous! And that table is absolutely amazing!!! I LOVE, LOVE, LOVE this color palette! So gorgeous! I love the deep colors and the warmness really makes me feel Fall! So lovely. I love the Blue and all the little details that scream Fall. 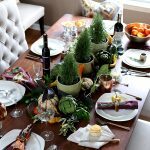 Your dining room is the first room that I’ve seen here on the many blogs I follow that actually reveals you. Your taste and choices aren’t bland like off white or gray everything. Thanks for the color palette and decor ideas. Hi Jenn! 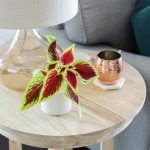 First time reader to your blog and love everything about this room you designed. 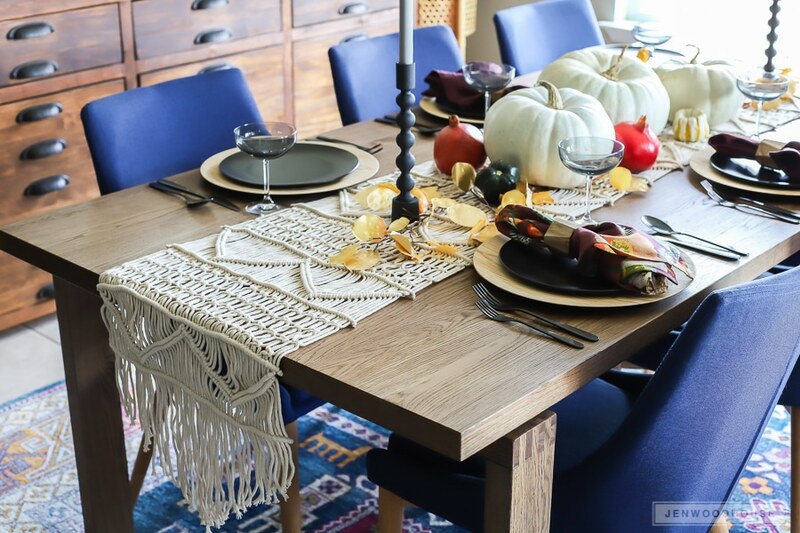 That table runner is gorgeous and that rug perfectly ties the room together. Awesome job!